Antonio Luna has had one hell of a life. He’s been a con man, street artist, World Series winner, private eye, and spy, but someone is trying to destroy his legacy by wiping out anyone who can corroborate his story. 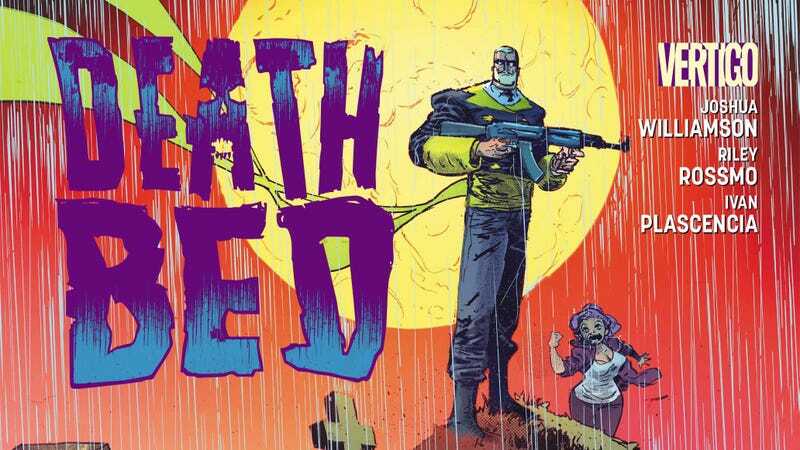 The new Vertigo series Deathbed is an exciting action-adventure about one man’s mission to stop the people who want to erase him from history, and writer Joshua Williamson, artist Riley Rossmo, and colorist Ivan Plascencia have delivered one of the strongest Vertigo debuts in years. (Read more about the first issue in Caitlin Rosberg’s Comics Panel review.) Williamson’s story balances high-stakes drama with a sense of humor, and the artwork by Rossmo and Plascencia accentuates that contrast of light and dark elements to give the book a vibrant, lively aesthetic without shying away from the horrors of Luna’s situation. This exclusive preview of this week’s Deathbed #2 shows Luna racing through the streets of Paris with the ghostwriter of his autobiography, Valentine Richards, who quickly learns that this assignment is very different from anything she’s done before. The opening splash page begins the issue with a burst of momentum, and this excerpt spotlights Rossmo’s dynamic compositions and layouts, with particularly strong use of two-page spreads to amplify the scale of the narrative. The final spread shows how Plascencia’s coloring informs the narrative, and flashback panels are colored with bright colors that fade to black, white, and blood red for the present-day shots of the dead bodies of Luna’s old accomplices. The richness of the past is stripped away by death, and Luna is desperately trying to hold on to his glory days by saving the people who lived them with him.